In this new GL-12 exercise video, I reveal how to lift your way lean and strong in a quick but powerful workout progression for your total body. Welcome! Now that you’ve progressed through my Rep-Range Lactic Acid (RRLA) Workouts to prime your body for muscular development and the release of growth hormones to really get your body into a fat-burning environment, we’re going to step up to phase two of our exercises. With these Metabolic Resistance Training workouts you’re going to get a 38- to 48-hour afterburn, so your metabolism will still be burning calories and fat at an elevated rate for up to two days after you complete these short but intense workouts! At the same time, these workouts will really improve your conditioning and endurance, as the MRT workouts are focused on time rather than reps.
By combining the RRLA exercises that focused on muscular development to help give you that lean, toned, celebrity Hollywood look with these MRT workouts that target conditioning, we’re going to be programming your body to go from burning just sugars in food to really being a total fat burner. This form of training and nutrition working together will help make that happen for you. These MRT exercises are set up in a triple-set fashion. That means it’s three exercises done back to back (to back). And they’re done for 30 seconds at a time with 30 seconds rest in between. So check out the Get Lean in 12 team in action in the video above as I walk you through your very first triple set of MRT exercises, including several progressive compound movements that target both your upper and lower body muscle groups for a total body, fat-burning workout. 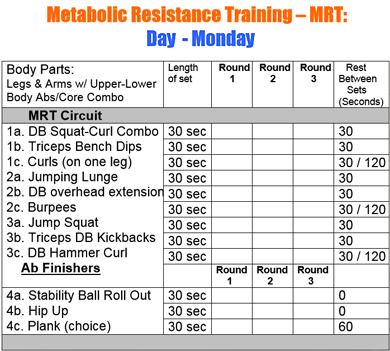 As always, work hard and smart here, and please let me know what you think of the Metabolic Resistance Training workout and how well they’re working for you. Want Weight Loss Motivation? Kill Your Evil Twin.